Those with hundreds of dollars burning a hole in their likely very expensive pockets are advised to head over to NG:DEV.DIRECT, as a limited quantity of Fast Striker AES packages are available to order again. Previously sold out, an undiscolsed amount are in stock again thanks to some canceled pre-orders. Retailing for 499 euros (currenly $770 US before shipping), the game includes the AES art, a shock box, insert, manual and holographic serial number stick. The game was developed independently by NG:DEV.TEAM and released in 2010 for Dreamcast and MVS. 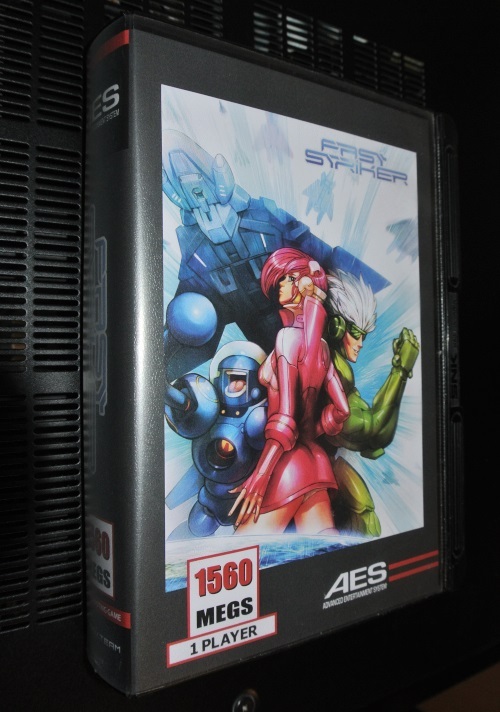 This is the game’s AES debut and limited to only 150-200 copies worldwide. Head over here to order the English label version of the game and here for the Japanese. While the price tag may seem exorbitant, it’s not rare for NG:DEV.TEAM games to increase in value, so this may not be the worst investment. Of course, the game can be had for $2.99 on iTunes, so it’s going to take a lot of internal convincing and/or berating from a spouse to snag the AES version.